The latest version of the post production software of Apple, Final Cut Pro is out here and it comes with loads of features that pleasures the concerned people put there. Multi channel audio editing is one of the noteworthy changes made in the software version. With this, the editing of multichannel audio is faster and elegant than ever. The various audio channels can be separated and collapsed as and when needed using some simple key strokes. You can select the ranges for controlling volume and time. The inspector displays various details such as name of the audio file, etc and enables editing them in the timeline. The import function is provided by the simple yet powerful interface which makes it possible to connect with video cameras, hard drives, network locations etc. List views and filmstrip views are the types of views available in the software. The presets are available for a range of services which optimizes the delivery time of the work. You can also customize settings based on your interests and load them in the software. Add various files together or add only a portion of a file to edit and play. Chapter markers can be used to seamlessly interact among various chapters and media players. The dual viewer option helps in comparing shots and matching actions of the videos. This helps you to adjust the footage based on the comparison. The red videos can directly be imported using the software and can be edited right away. The software provides native support for the .r3d files. You can seamlessly convert the .r3d files to pro res 4444 or pro res proxy files. The Red Rocket card can be used to work in background in accelerating, rendering and playing back videos. The Meizler module can be used to record the RedCode raw files and ProRes files. The attributes of the videos can be easily copied and pasted. The interface makes it simple to view the source files and select the attributes based on your needs. 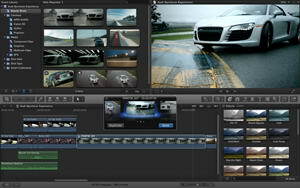 The Final Cut Pro software works in tandem with MXF files, thanks to the plug-ins that are available in the market. Other noteworthy features include flexible clip connections, drop shadow, one step freeze frame, enhanced compound clips, selection options, multi-cam facility etc. This software, thus satisfies all your needs of post production works. What are the greatest Macintosh software?